“Water flows because it's willing.” ― Marty Rubin In life, I have learned to go with the flow. OK, most of the time. I am human! AM yoga is never a peaceful, alone process. There are kids, cats, and a dog always interrupting the tranquility. I have learned to go with the flow. It makes it more pleasant in the long haul. I relate this to life, things just come up that we have to work around. 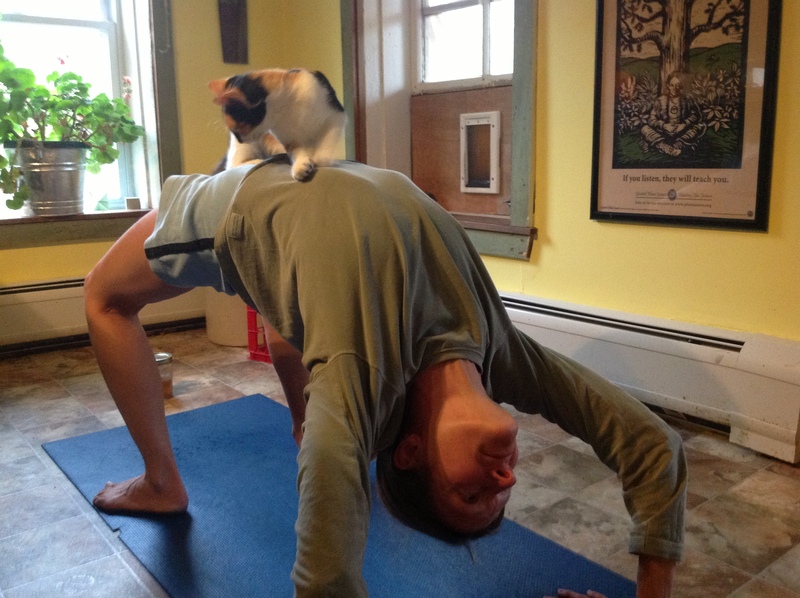 Like the below cat, Ember, who thinks she has to be a part of every yoga pose I do! She will be outside, doing her cat thing, when I start to do my AM yoga. Bam, she comes exploding through the cat door (which happens to be right next to my "yoga studio", see cat door in the window!) every time and is under me, on top of me, purring up a storm and thinking yoga is the best thing in the world! I think she hears the "whisper" of the yoga mat as it gently lands on the floor for me to begin my morning poses. I think that mat and Ember have some intuitive communication going on! Where is your life can you release and just let life flow, be willing to let go? Can you tell I love kitties? This 'lil hint came from my sister Terry. As you know, I make home made mayonnaise with olive oil, http://wholefoodhealer.com/2013/07/14/olive-oil-mayonnaise/. I never thought to use my homemade creamy dressings, as a mayo alternative. I am very thankful for my sisters and their wisdom! "Ok, so I did not have any mayo freshly made for my sandwich yesterday, so I substituted….i used the creamy dressing I had in the refrigerator. The recipe in Paula’s book…..it makes a lovely gourmet “mayo”, without the mayo. Give it a try on a sandwich next time." I was not sure which "flavor" Terry was using that fated sandwich day, so I am adding all the recipes! You can re-create any flavor of creamy salad dressing using plain, unsweetened yogurt. Making homemade dressings is a great way to avoid commercial products. Read the labels, they are scary. Most commercial dressings are made with cheap vegetable oils and GMO ingredients. Do not make huge quantities at a time unless you will use them up within a week or so. Foods without preservatives will get moldy far quicker than commercial products. These dressings all taste best when given one hour for the flavors to meld. Enjoy them on salads or as dips for veggie sticks and chunks! Roquefort Dressing This is a French sheep's milk blue cheese, if you prefer, substitute your favorite blue cheese. Blend all ingredients well, except the cheese. Gently fold in cheese. In a medium bowl, whisk together the garlic, anchovy paste, lemon juice, Dijon mustard and Worcestershire sauce. Add the yogurt, Parmigiano-Reggiano, salt and pepper and whisk until well combined. Taste and adjust to your liking. 1-2 tbsp. apple cider vinegar, add slowly to the consistency you want to create. Mix ingredients together. Slowly add the vinegar last.